A few weeks ago, Gabe and I decided to go on a juice diet for 3 days. I grabbed my reusable grocery bags and headed off to our local farmers market. $100 later on just fruits and veggies, I went into full blown juicing mode. The Superfood juicing journey was very short lived in our household - I lasted for literally one meal replacement while Gabe lasted for one day. We made the decision to juice in the morning as a meal replacement. After research, we have found a flavor combo we are both fans of. Juicing in the mornings is a great energy booster. One days I juice, I can go without my morning cup of coffee. What I dislike about juicing in the morning is the length of time it takes. I'm usually in a rush in the mornings and the last thing I want to do is clean the pulp out of my juicer. I was then introduced to Cell-nique Super Green. A USDA organic drink that energizes, detoxifies and nourishes your body with the equivalent of 8 servings of fruits & vegetables in every bottle. Cell-nique is Vegan, gluten-free, low-calorie. 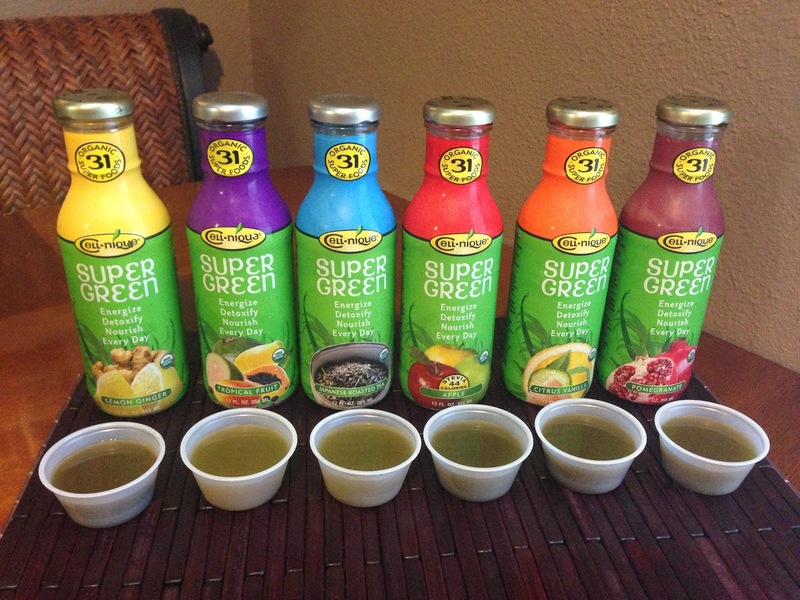 All flavors of Cell-nique Super Green contain the same 31 organic superfoods. Most of the sugar count comes from the naturally occurring sugars in the fruits and vegetables, with a small amount of stevia and organic blue agave. Cell-nique has 3 flavor groups for your individual pallets: Earthy, Fruity and Decadent. The green drinks were much better than I expected! My favorite flavor was the Apple and at close second was Japanese Green Tea. The best part of Cell-nique is that they are detox drinks. I need a case of Cell-nique after the weekend I had! DISCLOSURE: this was a compensated review of the Cell-nique. All opinions are my own.